Ignite your imagination with these new creative prompt cards, made by a designer. Where do you turn to for creative inspiration? Some creatives use inspirational apps to get the juices flowing, online tools such as Pinterest, Behance and Dribble to build up a reserve of idea fuel, while others are able to use what's at hand in the world around them to ignite their imaginations. Regardless of how you come up with ideas, there will come a time when you hit a creative roadblock. (This usually happens when you finally get down to work and you're faced with an empty page waiting to be filled. So watch out for that.) To help creatives get over this hurdle, Matt Vojacek, creative director of video marketing and animation company Zwelly Co, made The Game of Creativity. 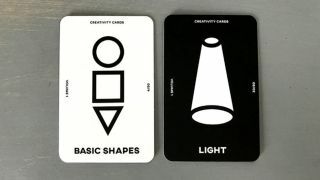 Made up of a deck of prompts, The Game of Creativity is a thought connection tool. There are lots of ways to play, but Vojacek recommends creatives start out by flipping over two cards and exploring how they could solve the problem or brief they're set. Watch him guide you through the game in the video below. The prompts on the cards range from everyday objects such as "plant" and "string", through to more abstract suggestions like "8 bit" and "vintage". "I made The Game Of Creativity as a way to be more inspired by my own thoughts," Vojacek explains on the game's Kickstarter page. "I like to think of creativity as one's ability to make connections between two or more things. And The Game Of Creativity is a fun way to help you do just that, very quickly and easily." Which combination will you get? With thousands of possible combinations on the cards, The Game of Creativity is a versatile way of sparking up ideas. If you're a fan of the deck, you'll be pleased to hear that it has already smashed its Kickstarter goal. However, if you want to secure a pack or more for yourself, we recommend you head over to The Game of Creativity Kickstarter page and make a pledge. There are 26 days to go, so there's plenty of time. And who knows, if things keep going well, perhaps Vojacek will add a stretch goal or two?